Robert Gould, MD is an Associate Adjunct Professor in the Department of Obstetrics, Gynecology and Reproductive Sciences at the University of California San Francisco School of Medicine where he also serves as the Director of Health Professional Outreach and Education for the Program on Reproductive Health and the Environment (PRHE). Until 2012, Dr. Gould worked as a pathologist at Kaiser Hospital in San Jose, California. He has been President of the PSR San Francisco-Bay Area since 1989. Dr. Gould serves as a chairperson in the American Public Health Association’s Peace Caucus. In 2009, the APHA awarded Dr. Gould the prestigious Sidel-Levy Peace Award. 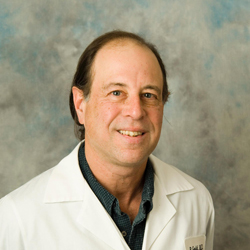 Dr. Gould is also a leading member of the Environmental Committee of the Santa Clara County chapter of the California Medical Association (CMA). Dr. Gould has authored numerous book chapters on the health impacts of nuclear weapons including War and Public Health (2007, Oxford University Press) and Terrorism and Public Health (2011, Oxford University Press).